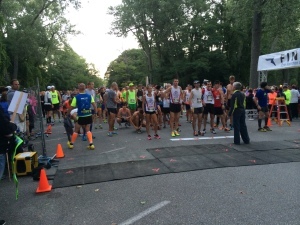 Have you ever been at a local race and found yourself wondering how many people around you have similar running interests to you? A couple of weeks ago when I ran the Rock Hall Half Marathon in Cleveland, Ohio I started thinking to myself, “I wonder how many people running this race also ran runDisney races?” Well this one thought sparked a game I began playing in my head of how I could pick out other runDisney runners. 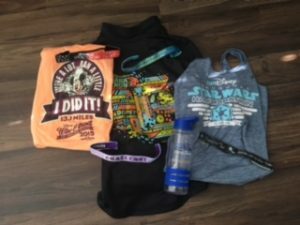 Thus, I have come up with five ways to spot a runDisney runner at a local race. 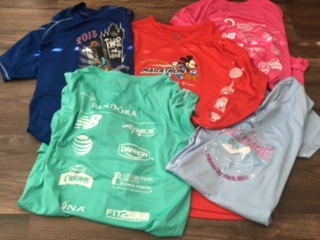 This is an obvious one: a runDisney Race Participant shirt is a giveaway that someone has run in a runDisney race. These shirts are extremely easy to recognize even from behind because the sponsors tend to be placed the exact same way across the back of all of their shirts. These shirts also tend to be bright colors if they are the t-Shirt version and are easy to pick out. If they are the long sleeve version it is also easy to pick them out because the park icons are on the sleeve. These seem like obvious things to pick out, but sometimes they are a little harder to notice until you are up close to the runner because the logo is usually very small. The easiest way to pick these out is from former races where you previously saw the merchandise and can identify and recognize it. I tend to purchase a Sweaty Band from a runDisney race (sort of a commemorative souvenir in my mind), these can be very hard to pick out till you are running next to someone because the logo is usually right by their ear. At the Rock Hall Half Marathon I noticed someone running with a CamelBak that had a Yoda key chain dangling on it. I definitely found myself wondering for a good mile until I caught up with this person if they were a runDisney runner…turns out I was right in my guessing: as I approached this man I saw the runDisney logo on the side of his hat. I also made a great running friend through this. 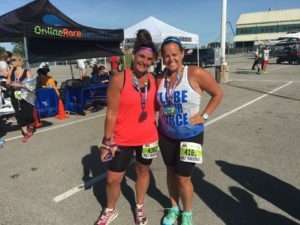 During the Cedar Point Half Marathon in 2015 I noticed someone (Stacy) with a runDisney sweaty band on and ended up finishing the last five miles of the race with her. We kept in touch throughout the next year and ended up running the entire Cedar Point Half Marathon together this year! Now these don’t necessarily mean that someone is a runDisney runner, but, if you see one on the course, its a pretty good indicator! 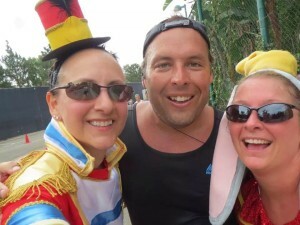 These runners love to have fun at races and enjoy dressing up, which is definitely two qualities that can be found in runDisney runners. 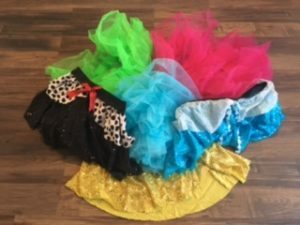 If those runners dressed in tutus and Sparkle Skirts have not run a runDisney race yet, I would almost bet that one is on their bucket lists. 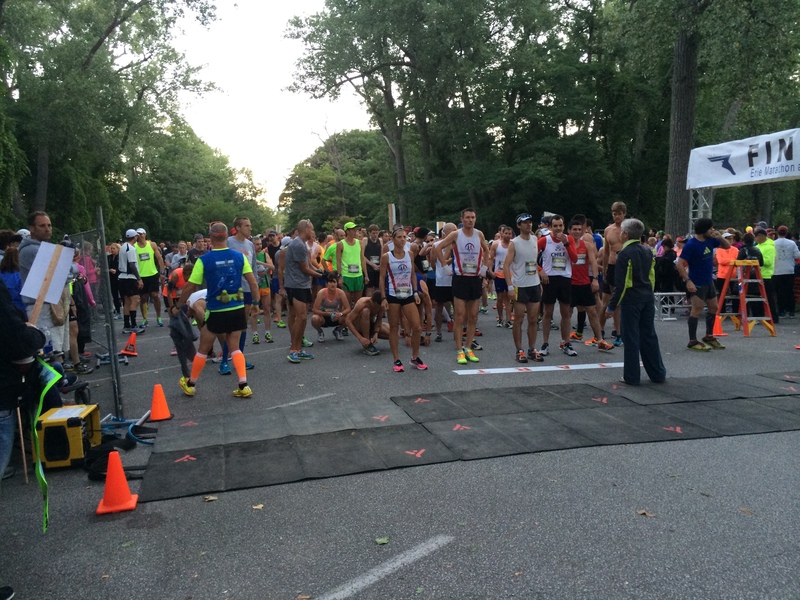 Have you ever been at a race and noticed someone raise their hand when they stop to walk? The best way to truly know at a local race if someone is a runDisney runner is to ask them if you noticed any of the four signs above. Throughout my many non-runDisney races I have talked to many runners just because I noticed these signs and, as a result, have had some great conversations that have made the miles fly by. One of my all time favorite conversations to have is with runners in Wine and Dine shirts from 2014 or 2015 to talk all about the “Splash and Dash” or the Half of a Half Marathon. If you are a runDisney runner you will always have something to talk to other runDisney runners about. So the next time you are running a non runDisney race, try spotting other runDisney runners and striking up a conversation. You never know if you will make a new running friend.